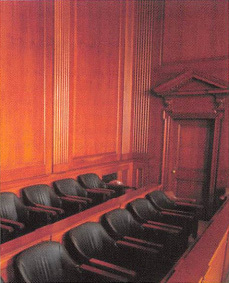 Don't Inadvertently Waive Your Right to a Jury Trial. Streamlined civil system makes it imperative that you timely request a jury. It is now very easy to waive the right to a jury trial in any personal-injury case filed in the newly reorganized Los Angeles Superior Court, or in any other courts that follow a similar system, where the case is set for trial upon being filed. (4) By failing to announce that a jury is required, at the time the cause is first set for trial, if it is set upon notice or stipulation, or within five days after notice of setting if it is set without notice or stipulation. As we all know, in Los Angeles County, effective March 18, 2013, all personal injury cases must be filed in the Central District, in downtown Los Angeles. In these actions, the court has done away with the Case Management Conference, and sets the case for trial on the day the case is filed. The result is that plaintiff’s counsel has five days from the date the complaint is filed to demand a jury. Although it is unlikely that this result was intended when the reorganization was contemplated, the result is that it is now very easy for lawyers to inadvertently waive a jury. If counsel refuses to stipulate, I suggest you immediately file a motion for relief. The following authorities may help. If you haven’t done so already, make it a practice when filing a personal injury case to demand your jury in your original complaint, in order to avoid an inadvertent waiver. Gary C. Eto is a trial lawyer in Torrance, California, who handles cases involving catastrophic personal injuries, product liability actions with an emphasis on defective vehicles and tires, and wrongful death actions. He earned both his undergraduate and law degrees from UCLA. He has tried multiple civil and criminal cases to verdict, is a member of CAALA, the Attorneys Information Exchange Group; a lifetime member of: the John Langston Bar Association, Japanese American Bar Association, Filipino American Bar Association; and a founding member of the Thai American Bar Association. This was originally published in The Advocate and can be download as a PDF.